Tourists and animal lovers hoping to see a bear in Sequoia National Park this fall probably stand a better chance of spotting one in this tiny town at the park's entrance. Three Rivers is literally crawling with hungry bears driven down from the mountains by drought in search of food to fatten up for winter. Everyone seems to have photos of the creatures on their phones or anecdotes of encounters. Chas Haws' eyes bugged out as he recalled his surprise coming face to face with a bear before dawn as he walked to Antoinette's Coffee and Goodies shop along the main road one day. He carefully stepped back as the bear reared up and then walked away. "He didn't care about me at all," Haws said. "I didn't smell like a muffin - yet." There's no doubt a bear invasion is afoot in this town of 2,200 that is home to an eclectic mix of park employees, cattle ranchers, hippies, yuppies and artists. It is also a retreat for Hollywood types that include Anjelica Huston and William Shatner. Most seem delighted by the visiting black bears - many brown and cinnamon in color - lumbering through grasslands, trotting across roads or wading through rivers. The four-year drought has shriveled the berry crop in the Sierra Nevada and led oaks on parched hillsides to produce fewer acorns, forcing the bears into the valleys carved by the branches of the Kaweah River that give this town its name. Water is plentiful and acorns carpet the ground. Gregory Lockhart had seen one bear in 27 years until this season. Now they're fixtures on the golf course out his back door and have been spotted by the pool of a guest house. "The park is upon us now," he said. One resident suggested on a town Facebook forum that people with guests seeking bears not bother winding up the road to the park. Others chimed in with suggestions of where to find them. A crowd formed recently outside the River View restaurant to gawk at a bear up a tree. Bears have climbed on roofs for acorns and one was found exploring a bathroom under renovation in a house. A bear tore apart the outer walls of a resident's pump house and a music studio to get at acorns a woodpecker had stowed in the siding. Quiet nights are interrupted by air horns, banging on pots or a gunshot to scare off creatures known to forage 20 hours a day as they prepare for long winter naps. But some wonder if those shots are innocent. Jeff Beck heard dogs barking in the middle of the night followed by gunfire. "People are shooting the bears, there's no doubt," he said. The Kaweah Commonwealth reported that bears have been illegally slaughtered, but game wardens dismissed it as far-fetched because of a lack of evidence, such as names of suspects, vehicle descriptions or dead bears, Lt. Doug Barnhart said. The account, however, has sown conflict between nature lovers and those who think it's a tall tale. "I'm upset and sad, and I just question, 'Why?'" said Kathleen McCleary, who noted a sense of outrage in some circles. "I don't see any reason to be shooting them." Darrell Fleeman was so disgusted with the story that he yanked his auto repair shop ad from the newspaper. "Where's the proof?" he said. "If that were the case, there'd be dead bears everywhere." State game wardens haven't had as many complaints in this area of central California as last season, when bears made it to the San Joaquin Valley cities of Visalia, Porterville and Bakersfield, Barnhart said. Residents have legally killed bears that broke into cabins and cars in Springville and Camp Nelson, about 25 miles south. In Three Rivers, bears have knocked over plenty of garbage cans and raided fruit trees and grape vines. They did a number on the apple orchard at Shatner's Belle Reve ranch, said caretaker Sal Natoli, who added that he got a depredation permit to kill the culprits but didn't use it during the two-week period it was valid. The trees look "just like Venus de Milo," the armless ancient Greek statue, Natoli said. 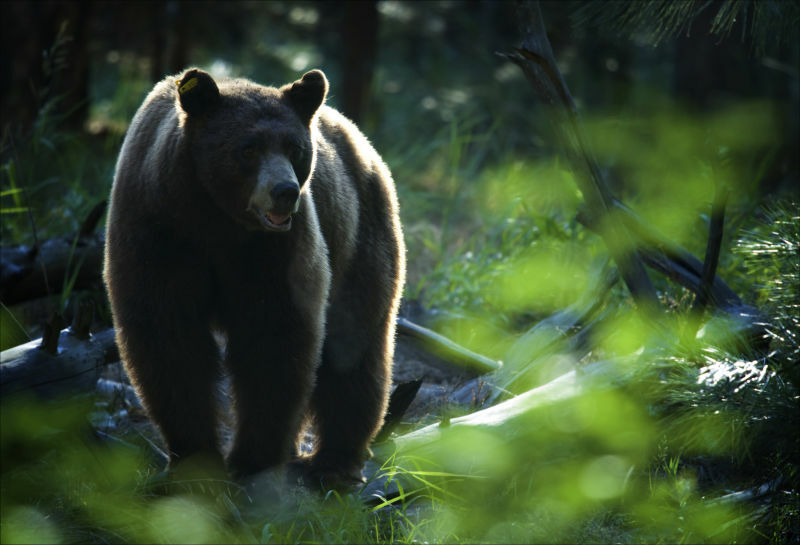 Bear hunting season runs until Dec. 27 or when a statewide limit of 1,700 bears is killed. The state hasn't come close to that figure since dogs were outlawed in the hunt in 2013. Gunfire may not be the biggest challenge for the bears at this point. If they don't pack on enough pounds, they won't return to the mountains to den for the winter, said David Graber, former chief scientist for the National Park Service for the West Coast and a longtime Three Rivers resident. "If they don't hibernate, they're going to die," Graber said. "That's a rare, uncommon event."